Why should IT equipment recycling be important to your business? IT Equipment Recycling is a hot topic at the moment. Recent press articles and TV documentaries such as the BBC’s Blue Planet and Drowning in Plastic have highlighted the huge negative impact waste has on our environment. 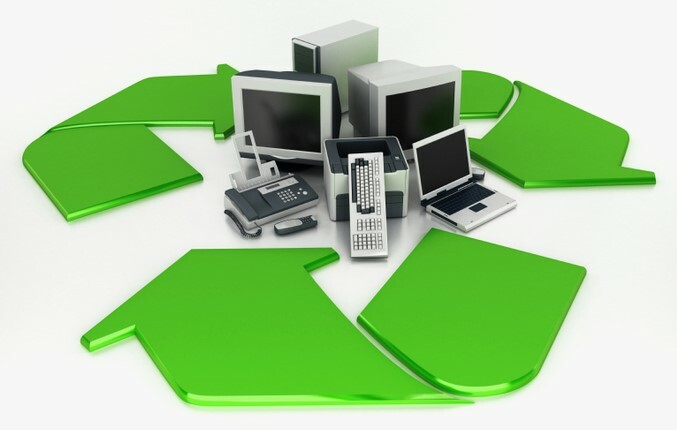 Companies can play a key role in helping to reduce environmental damage by recycling their old IT equipment such as PCs, laptops, tablets, servers and monitors. By recycling your old and unwanted IT hardware, you’re doing your bit to help the environment by preventing potentially hazardous waste from entering landfill and causing soil and water contamination. Plus, many parts of your old IT kit can be repurposed to make new equipment. Often producing recycled materials requires less energy than the manufacture of new equipment. Recycling also conserves energy by reducing the need for transportation of raw materials, which also decreases greenhouse gas emissions and vehicle emissions during shipping. Another important consideration is the safe disposal of the old IT equipment. Discarded computer equipment needs to be disposed of in a safe and controlled manner because it can contain toxic substances and is effectively classed as hazardous waste. In 2007, the Waste Electrical and Electronic Equipment (WEEE) Directive was introduced. The legislation aims to reduce the amount of electrical and electronic equipment being produced and to encourage everyone to reuse, recycle and recover it. Basically, the WEEE recycling initiative means you are legally obliged to dispose or recycle your IT hardware equipment safely and securely. And this is where the team of experts at Asset Remarketing can help. Formed in 2016 we have established ourselves as the number one online resource for your used IT equipment. All our services fully adhere to all WEEE regulations and UK legislations best practice. We are also certified by the British Security Industry Association (BSIA) and follow ethical disposal practices with all the equipment we handle. We provide a total solution from secure data deletion, testing, collection through to disposal, which enables our clients to efficiently dispose of their redundant IT hardware, and we’ll give you some money in return. At Asset Remarketing we want to make it easy for both small and large UK based organisations to sell used IT equipment and receive money back. We want to make the process simple for you and give you the opportunity to earn some money, while also securely recycling your old equipment in an environmentally friendly way. After entering a few simple details via our website, we then evaluate your old equipment and provide you with a competitive quote for its disposal and recycling. Plus, we provide a free national collection service to securely transport your old equipment to our secure site in Manchester. Our cashback offer gives you a financial boost to aid your business that can be reinvested into other projects to help your business grow. Get in touch with today either via email or on 0161 641 4843 for further information and receive a free quote for the purchase and disposal of your unwanted IT equipment. Asset Remarketing of Stockport, Manchester are one of the UK’s leading IT equipment recycling companies. Dedicated to reusing, reducing and recycling IT equipment.